Garlic is a member of the allium family which also includes leeks, shallots and onions. Individual cloves act as seeds. The bulbs grow underground and the leaves shoot in to the air. Although garlic is traditionally thought of as a Mediterranean ingredient garlic is also grown successfully in colder more Northern climates. Garlic is one of the easiest and most satisfying crops you can grow, so if you are a beginner and have just got your plot – clear a space now and get started! If you have a more established plot then why not also make the most of garlic’s properties as an excellent companion plant (The term “companion planting” refers to growing different plants together with mutual benefits to both). Garlic co-planting is especially beneficial to lettuce (where it apparently deters aphids) and cabbage (deterring many common pests). As well as protecting other plants garlic can also improve their flavour. Beets and cabbage are reported to be especially good companions that benefit from this. It’s also reputed to be a good companion plant for roses and other shrubs, supposedly detering greenfly. 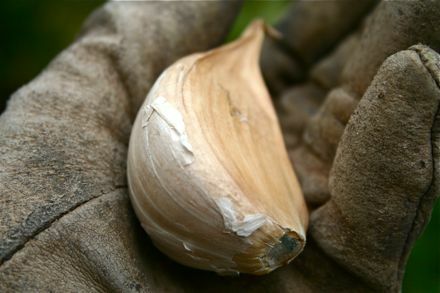 Finally, as well as co-planting the cloves themselves, you can use garlic extracts to protect other crops. There is a long tradition of treating plants with garlic solution. Recently, scientists at Newcastle University confirmed scientifically that garlic oil is effective at repelling and even killing snails and slugs. But beware! Not all companion planting combinations are beneficial. Garlic doesn’t seem to cooperate well with legumes (beans and pulses), peas or potatoes. Try not to plant these too near your garlic. Garlic also has many medicinal properties (its anti-bacterial and cholesterol reducing properties being most well-known), and deters vampires. I am a novice ‘allotmenteer’ and have not had any success with garlic. They grow to almost maturity and then die off, the leaves drooping and the bulb rotting. I have been planting them in the same bed with red and white onions. I read somewhere that garlic shouldnt be planted in the same bed as onions. can anyone enlighten me? Hi Neil – try asking this on the forum (http://www.bhaf.org.uk/forum_id__1.aspx) too – and if you use facebook – try the bhaf facebook page – http://www.facebook.com/BHAFpage – good luck!